Safety covers are the strongest and most versatile type of pool covers available for in ground pool owners. They are typically made of heavy duty mesh or solid fabric and mount to the ground by spring-loaded grommets attaching to anchors planted in the ground surrounding the pool. This construction helps keep you and your family safe: the covers typically have a break strength of over four-thousand pounds. Even PcPools’ most economical version—the mesh safety cover with a 12-year warranty—offers this strength. Safety covers are the only type of cover that can support a person without the possibility of drowning. As a result, safety pool covers are sometimes referred to as a "horizontal fence" for your pool. Safety covers have always been sought after for their obvious benefit, but when they were first introduced homeowners had few options. You bought your plain, aqua colored cover and that was that. Demand is rising because style is finally catching up with function. PcPools offers custom safety covers in five different colors: Green, Blue, Tan, Gray, and Black. They are also available with three different anchor types tailored to the surface surrounding the pool: concrete, wood deck, and lawn/brick. It’s surprising that it took so long for this level of variety to be made available given the length and prominence with which safety covers are displayed. The pool is often the focal point of a backyard, and if it doubles as a winter cover it can be on display for most of the year. It’s no wonder consumers wanted more options. Tan and gray, in particular, are highly sought after because both of these colors offer a more natural look. The coordination with the surrounding flagstone or rock water features, for example, allows the cover to blend into the surroundings. These are especially popular with pool owners who consider the brighter-colored covers to be an eyesore. A side benefit of tan and gray safety covers is that they are best at hiding fading as well as dirt and grime. 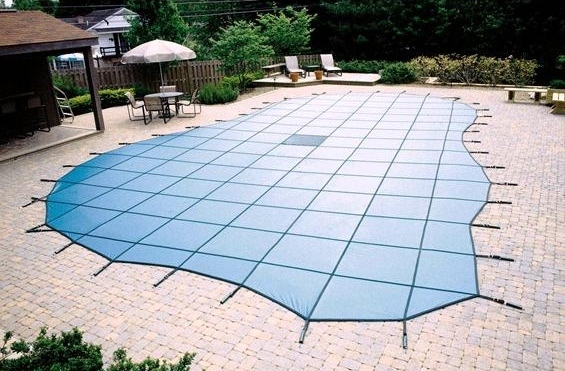 If the fabric or mesh safety cover doesn’t offer what you are searching for, pool owners who are willing to pay a few thousand dollars more can install an automatic safety cover system. These involve installing a track below the pool lip that the cover rolls out and in on. In addition to offering a look some pool owners desire, automatic covers are easier to use. They can be taken "on" and "off" your pool with the push of a button. Manually covering or uncovering a pool with a standard safety cover is not as convenient: it requires two adults and takes five to ten minutes.